HD Rotatable 2.5-inch LCD DVR with IR LEDs is simply designed with a plastic screw that attaches the camera assembly to the suction cup and operates even without user input. The suction cup is made from sturdy plastic that provides ample support and with the sufficient length of the charge cable, you can power up the dash cam by connecting it to the car charger. In the default mode, the camera records video continuously when the car starts, and ceases when the car stops. The rechargeable battery is an alternative source of power that allows you to use the camera outside the car in case of emergencies. If you are looking for an affordable, easy to mount and operate dashboard cam, then the you can compare HD Rotatable 2.5-inch LCD DVR with IR LEDs with the New 2.5-inch HD Video Camera Recorder Traffic Dashboard Camcorder and the Beelike 2.7-inch LCD Car DVR Digital Video Recorder with Night Vision and Motion. These dash cams perform well and produce good-quality videos despite the budget cost. If you are looking for an affordable, easy to use dashboard cam for your car that operates continuously without input then the HD Rotatable 2.5-inch LCD DVR with IR LEDs is the best option. It performs well as a video recorder in and out of the car since it comes with a rechargeable battery that you can use in lieu of the power from the car socket. It has a favorable rating among many users who have found its performance acceptable despite it being a low-budget device. The New 2.5-inch HD Video Camera Recorder Traffic Dashboard Camcorder features 270o whirl and is equipped with 6 LEDs to support night vision. It comes with a car charger for connection with the cigarette lighter which automatically powers the camera and records video for as long as the car engine is running. The viewing angle is 90 degrees and the recorded videos are stamped with the real time and date. The Beelike 2.7-inch LCD Car DVR Digital Video Recorder with Night Vision and Motion Detection seamlessly record videos through loop recording, overwriting the oldest files when the memory card is full. When powered through the car charger, it starts with the car and ceases to record when the engine is turned off. The dash cam provides video resolution of 1080P and supports night vision and motion detection. Additional features are a 120-degree wide angle lens and built-in speaker and microphone. When choosing a competitively-priced dashboard camera that performs well then the HD Rotatable 2.5-inch LCD DVR with IR LEDs is the best option with its wide angle view and lower resolution settings for less memory usage. 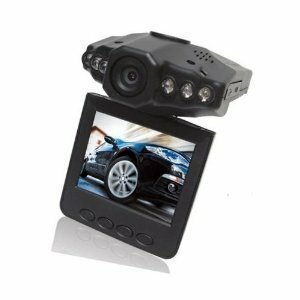 The second best choice is the New 2.5-inch HD Video Camera Recorder Traffic Dashboard Camcorder with its IR LEDs and night vision support, particularly when you frequently engage in nighttime driving. Finally, the pricier Beelike 2.7-inch LCD Car DVR Digital Video Recorder with Night Vision and Motion Detection is a good choice if you want a simple dash cam with additional features like external GPS support, auto focus and night vision.